At the start of every year, people make up resolutions. A number of these resolutions are travel related, as evidenced by the spike of traffic my travel blog (as well as every other travel blogs and sites) receive this time of the year. There’s also a spike in the sales of planners and organizers (and coffee/tea). There are already too many planners out there, but friends Andrea and Faith came up with one with the traveler in mind: the Wanderlust Journal. Where will you wander this year? The planner highlights Philippine festivals like the Sinulog (Cebu), Aurora day celebration (Aurora), Pintados de Passi (Iloilo), Bangus Festival (Dagupan), Pahiyas (Quezon), Baragatan (Palawan), Sandugo Festival (Bohol), Kadayawan (Davao), Feast of the Lady of Penafrancia (Bicol), Masskara (Bacolod), Higantes (Rizal) and Balabag Festival (Boracay). Even if you’re not a festival-going traveler, there are tips from travel bloggers Chichi, Mica, Melo, Dong Ho, Enrico Dee, Mary Jane and someone who goes by the name Nina. There are even discount coupons for accommodations and tours in Puerto Galera, Boracay, Bohol, Batangas, Ilocos, Palawan, Cebu, Mindoro, Zambales and Albay. Once upon a time, I was a planner user. Granted, I was in school then, so most of my activities happen during the week. However, once I started working from home and traveling, it’s my weekends that are packed. 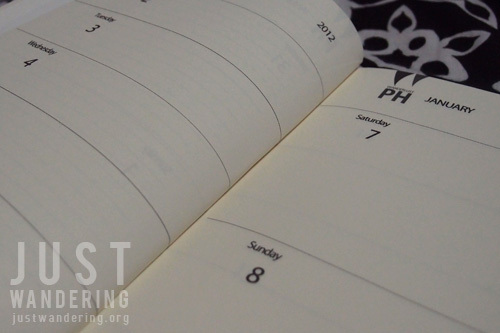 That’s why when I saw that the weekends have a bigger writing space than the other days of the week in the Wanderlust planner, I had to smile. The planner that puts an emphasis on the weekend. I like! So simple, yes? You can even raise your chances by tweeting as many destinations as you want. One destination per tweet, please. Winner will be picked through Random.org’s randomizer, and will be announced on January 28, 2012. Contest ends on 11:59pm, January 27, 2012. Don’t want to take your chances in the raffle or want your planner now? 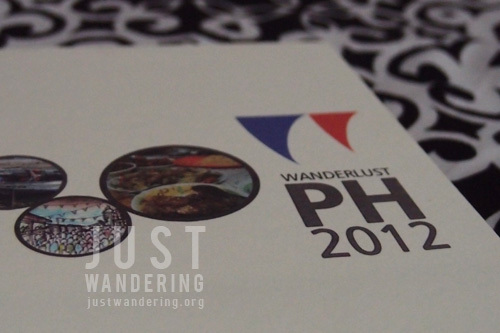 Wanderlust Journals are available in Powerbooks, Fullybooked, A Different Bookstore and Sketchbooks (Greenbelt 5) for Php499. This year, I pray my wanderlust will take me (out of) South Carolina! LOL. Just kidding. We’re working on our next duty assignment. J’s up for orders (don’t worry, we’ll catch up) & we’re going through options at the moment. I’ve missed you, my dearest, dearest, Nina, and I’m obviously going to play catch-up on your blog! 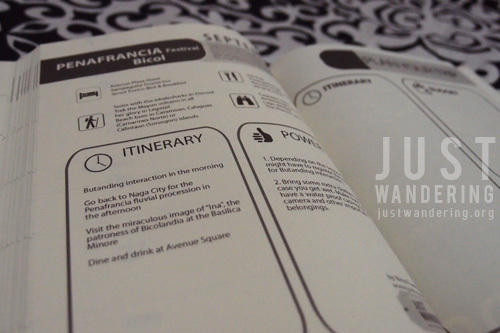 Okay, okay…I’m hoping my wanderlust takes me to Buenos Aires! …and I hope to catch up with you guys where ever you may be one of these days! Good luck Joy, and thanks for joining! I don’t usually have any resolution each year but on 2012, I have my eyes on Palawan, Vigan, Bohol and Sagada. Good choices! You’d have to tweet your answer to join the contest! My travelling is based on my husband’s business trips. We just tag along to avail of his free hotel, free hotel breakfasts,free renta car and free tickets(courtesy of airmiles). We never plan.Sometimes its just within a few days notice. I always think when you plan so much it doesnt push through. But thats another thing if you have to budget and save for a trip. i hope my bday wish will come true! *wink2* ? Go go! Madaming pang time to join! sayang, I read this post too late. I would have wanted one.